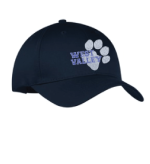 Show your West Valley pride! Purchase Spirit wear! Friday's are Spirit Wear day at West Valley! Spirit wear is available the first few weeks of every school year during the Spirit Wear campaign. This is the only opportunity to purchase spirit wear each year – so order while you can! Please be sure of the size. There are NO returns or exchanges. Samples are available in the school office to try on prior to ordering. Submit completed order form and payment to the WVPTO box in the school office.